When the executives at Paramount Pictures saw Billy Bob Thornton play a bitter, abusive, drunkard shopping-mall Kris Kringle in 2003's raunchy, bitingly funny "Bad Santa," they must have said to themselves, "If we water this down to a PG-13, we'll make a mint!" Thus was born the lackluster remake of 1976's "The Bad News Bears." 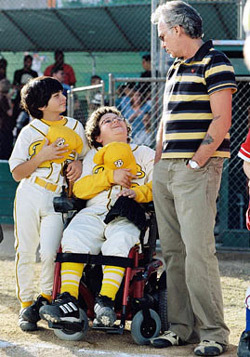 Once an edgy but family-friendly Little League comedy full of cursing pre-pubescent underdogs and starring Walter Matthau as their booze-hound coach, this 2005 version -- starring Thornton, co-written by "Bad Santa" screenwriters, and lazily directed by the usually creative Richard Linklater -- has lost both its bite and its heart. Thornton's uncharacteristically flat take on the character of coach Walter Buttermaker -- a trailer-park bum and exterminator by trade who once played half an inning in the pros -- has little of Matthau's cantankerous hound-dog congeniality. His "who cares" attitude toward his baseball team of delinquents, nerds, over-eaters, immigrants and paraplegics soon becomes humorously motivational abuse, then "win at all costs" obsessiveness, then "just have fun out there" altruism without much rationale beyond the screenplay's say-so. About half the kids are terrible actors, and in several scenes it feels as if Linklater ("Before Sunset," "Waking Life," "School of Rock") just gave up trying to get a good take out of them, leaving many jokes falling to the dugout floor with a wet thud. The central plot about the players' come-from-behind transformation into a cohesive team has similar problems: Linklater shows their failings (accompanied by music from Bizet's "Carmen," in a nod to the original) and later shows them winning, but offers up very little struggle in between. In fact, several story developments are referenced but never shown. The only coherent improvements to the Bears come with Buttermaker's recruiting of an ex-girlfriend's puberty-stricken, 12-year-old tomboy daughter (likeably sullen Sammi Kraft) as the team's new pitcher (played more memorably by Tatum O'Neal in 1976) and a 13-year-old motorcycle-riding bad boy (Jeff Davies) as its star batter (played far more memorably by Jackie Earle Haley in '76). "Bad News Bears" (these days Hollywood rarely bothers using "The" in movie titles) does hit several home runs with bad-taste one-liners ("You guys swing like Helen Keller at a piñata party") and sucker-punch scenes that toy with convention. When the coach's attempt at a genuinely motivational speech to his players fails, he just starts screaming at them -- and it lifts their spirits. But there's nothing about this remake that feels fresh or refurbished. In fact, with the exception of keeping the original's untraditional twist to the big-game finale (which Linklater slides right past without even pausing for suspense), it feels less like "The Bad News Bears" and more like the kind of cliché-riddled sports-underdog comedies that have been ripping off "The Bad News Bears" for 30 years.